If you’ve heard of Gaggan, the Indian restaurant in Bangkok that has been on top of Asia’s 50 Best Restaurants list for three years in a row, you would also have probably heard that it is slated to shut down in 2020. This decision is neither a marketing gimmick nor an act of arrogance. It was decided even before the restaurant was opened in 2007 that it would run only for ten years. “Every restaurant has a 10-year life after which it merely becomes a brand. 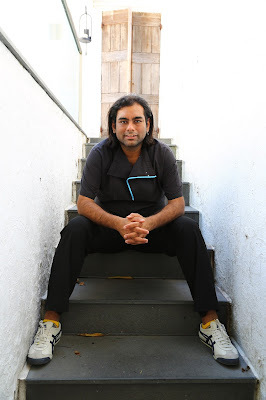 By announcing that we will shut Gaggan in 2020 I am only honouring my commitment,” states Chef Gaggan Anand. Gaggan’s passion is seen not only in his cooking but is also palpable in his speech. Always known for someone who speaks his heart out, he admits that his comments do get misconstrued at times. However, in a time when most celebrated chefs are rather conscious of the image that they portray, it is refreshing to see him easily express very strong emotions for things that he likes or not; well, actually it’s more like what he ‘loves’ or ‘hates’. For instance, he hates a lot of things such as fusion food, using foreign ingredients like bell peppers and zucchini in Indian dishes and chocolate paan! What he loves, on the other hand, is innovation in food, sticking to regional flavours yet appealing to a global audience. While he attempts to cut across language barriers, Gaggan also likes to have fun. So, diners in his restaurant are presented with a menu containing only emojis. He also enjoys turning things around – his 25-course chef’s menu starts with a paan, something that would typically be had at the end of a meal. But needless to say, it is not the sort of paan that one is accustomed to. In fact, many of his dishes look deceptive – he presents the best of Indian flavours in a plating style that challenges common food perceptions. This also keeps up the surprise element and wow factor that he loves to serve along with delicious ‘real’ food. At the end of their meal, however, diners are given a menu with words to let them know what they’ve just consumed. Another way in which Indian-ness is maintained in his globally acclaimed restaurant is that the first 23 courses are eaten by hand. “I don’t make Indian food look French, I simply make it look beautiful,” he shares. “One day, if I get a chance, I would like to get a law passed to protect Indian cuisine,” he says adding that we have diluted our food heritage. “Japan on the other hand has maintained the sanctity of their cuisine.” It is thus interesting that Gaggan is all set to partner with Takeshi Fukuyama of La Maison de La Nature Goh, to open a tiny restaurant in Japan called GohGan in 2020. “We will change the history of food,” claims Gaggan. “For the first time, two top chefs, from different parts of the world will come together to open one restaurant,” he says with pride. While he plans to play chef only in one restaurant at a time, he has already started investing in other restaurants, backing culinary talent that he believes in. These include Suhring, which serves modern German cuisine; Gaa, a European-Asian fusion restaurant that uses local Thai produce; and a casual steakhouse, Meatlicious. Gaggan was recently in India for a culinary pop-up with Taj Hotels in four cities – Mumbai, New Delhi, Bengaluru and Chennai. We caught up with him for a candid conversation at The Chambers, Taj Mansingh, where he “learnt cooking”. Clearly very happy in the environ, he enjoys narrating anecdotes from the days when he worked in this iconic hotel. Since then, his journey to Asia’s No. 1 Chef has been full of enriching experiences. He has thus been approached with several book offers but has resisted so far. “People want to make money off me, but I don’t want to sell my soul to the devil,” he states unabashedly. Instead, he is working on a book that he hopes will inspire people to cook. “I will release it right after serving my last meal at Gaggan in 2020; it will be available in five languages on the Internet, free for all.” But don’t get disheartened if you don’t find Gaggan’s recipes in there because “you can’t cook at home what I serve in my restaurant” he states matter of factly. Eat local, even if it means eating four meals in a day and spending hours in the toilet subsequently. Japan; Lyon, France; San Sebastian, Spain. Aromatics like cumin and cardamom. I don’t use any garam masala in my kitchen. Anything that I can eat with my hand. Mostly it is dal, chaawal and a pickle. This article first appeared on travelandleisureindia.in on November 21, 2017.